Go Bed-and-Breakfasting for Father’s Day Weekend! Father’s Day is coming, and what Dad really wants is another…. tie? Of course not; what Dad wants is fun and luxury, and perhaps even a touch of adventure. Here are some great bed and breakfast stays that will beat a tie any day. 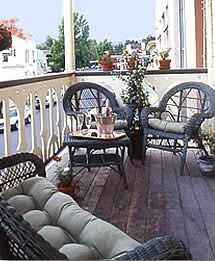 The Portobello Inn Bed & Breakfast in Herkimer, N.Y., is a perfect getaway spot for a Dad who loves to be surrounded by history. The New York bed and breakfast was built in 1840 and retains its Italianate charm with a wraparound veranda and rooms decorated in period charm. The original 1760 homestead also is still on site. Dad can spend his time visiting the Baseball Hall of Fame in nearby Cooperstown, take a ride on the Adirondack Scenic Railroad, visit a number of museums or take a cruise along the Erie Canal. If he prefers, he can just relax on the porch with a good book and enjoy the view. Is Dad a Wild West fan with a taste for the supernatural? Then take this closet cowboy to the 1859 Historic National Hotel in Jamestown, Calif. Opened in 1859 in California’s Gold Country, the National Hotel has been in operation continuously since then. During all those years a lot of gold dust has crossed this B&B’s original redwood bar. Legalized prostitution was conducted here until 1930, and the site had a casino until 1949. Dad will not only appreciate the hotel’s colorful history, but its beautiful guest rooms, as well. Each of the rooms is individually decorated in period style with antiques. The rooms include a private bath, but there is also a Soaking Room, where guests can relax in antique clawfoot tub. After a full, buffet breakfast, head out into the historic town and visit Gold Rush sites or drive to spectacular Yosemite National Park. Who Says Dads Don’t Enjoy Romance? We know Mom will have a great time, but why wouldn’t Dad enjoy a weekend of gourmet breakfasts, sea breezes and relaxation. 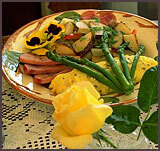 Guests at The White Doe Inn enjoy all North Carolina’s Outer Banks have to offer. Built in 1910 and listed on the National Register of Historic Places, this Roanoke Island bed and breakfast features elegant, romantic bed chambers decorated with antiques and period reproductions. Each room includes a fireplace and plenty of relaxing amenities. In-room spa service is available, and the innkeepers offer special add-ons, such as a picnic for two or perhaps the Romantic Interlude Tray, which includes chocolate dipped strawberries, champagne, fresh flowers and much more. Guests can explore the surrounding village of Manteo, and the ocean is just a few minutes walk from the bed and breakfast. With its close access to more than 200 lakes, as well as hundreds of miles of the Muskegon River, La Belle de la Riviere is a perfect spot for Dad to enjoy a getaway of hunting, fishing and kayaking. Those activities are just the tip of the iceberg at this historic Newaygo, Michigan bed and breakfast. Canoeing, hiking, biking and golf are among the other fun options. 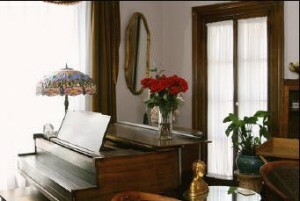 The restored 1871 mansion features period Victorian dcor in the romantic guest rooms, so bring Mom along. After a gourmet French breakfast, guests can enjoy a walk along the river or stroll through the town’s historic district. Whatever the choice, this is one vacation Dad will never forget.